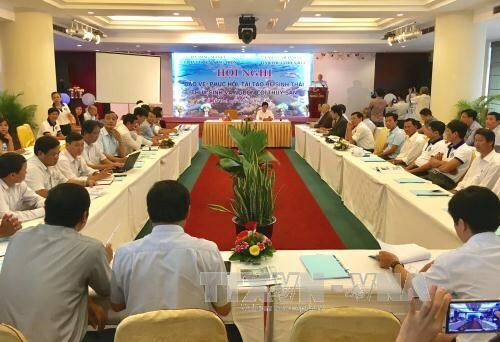 Thua Thien-Hue (VNA) – A conference took place in the central province of Thua Thien – Hue on August 31 to discuss the protection and resilience of the marine ecosystem in the waters in the four central regions that suffered from mass fish deaths last year. Mass fish deaths, caused by wastewater discharged by Taiwan’s Hung Nghiep Formosa Ha Tinh steel company, were first reported in Ha Tinh on April 6, 2016. The incident also occurred in Quang Binh, Quang Tri and Thua Thien Hue. As a result, more than 200 kilometres of coastline were polluted, devastating the marine environment and local economies of those provinces, which largely rely on fishing and tourism. According to a report from the Research Institute for Marine Fisheries, after the incident, aquatic resources in the waters have declined significantly and been experiencing structural fluctuations. Species living on, in, or near the seabed and coral reef systems have been degraded with little recovery. Fishing in these areas has been resumed but is yet stable. At the function, Deputy Minister of Agriculture and Rural Development Vu Van Tam pointed to a number of measures, including replanting coral reefs, building artificial ecology to provide shelters for sea creatures, and closely monitoring recovery capacity of the ecosystem. Nguyen Van Huan, Vice Director of the Quang Tri Department of Agriculture and Rural Development, said annual release of fry and fishing ban in the breeding season are necessary, alongside the control of illegal fishing methods and development of funds for marine protection and rehabilitation.